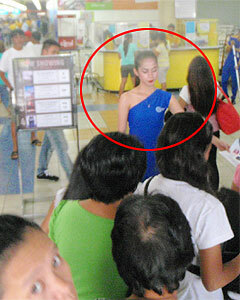 I was lining up for bag inspection to enter NCCC Mall in Matina. When my turn came, I casually opened my backpack for the routine inspection. But when I leveled my head to look at the guard, what I saw in front of me was this beautiful lady in an off-shoulder skin-tight short dress with killer looks to start another Trojan War. ps - turns out there really was a guard on the side, and the beautiful lady was a hired model to promote Globe's new product. She was handing out leaflets to everyone entering the mall.